Quick Charge 2.0 chargers juice up compatible devices real fast. Keeping with the spirit of their rapid efficiency, I'm going to tell you about a great deal on a Quick Charge 2.0 wall charger speedy quick. 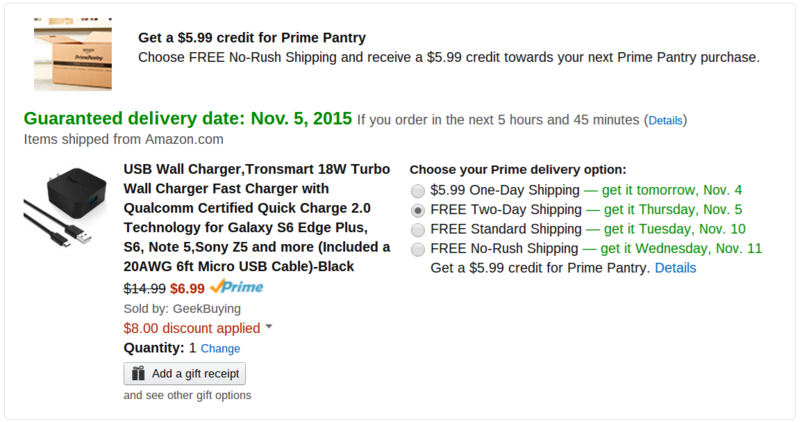 On Amazon you can buy a 4.2 star rated 18W Tronsmart QC 2.0 Turbo wall charger for just $6.99 after applying coupon code UQ9S44HS at checkout. That's 8 bucks less than the normal price. Not bad. The charger comes with a six-foot 20A MicroUSB cable and is backed by a solid 18 month warranty. Prime users can take advantage of free shipping. I bought one of these chargers a couple of months ago and can tell you myself that it works great and is very durable. Grab one for yourself using the link below. Better do it quick though, because these deals can disappear in a snap.